In the opening round we start with two easy drinking Amber Ales. Let’s start by meeting the contestants. Bleeding Buckeye by Elevator Brewing (Columbus, OH) – We start with the most natural beer to represent Ohio State Football—Bleeding Buckeye by Elevator Brewing here in Columbus. Elevator Brewing is located in downtown Columbus in a beautiful old bar and restaurant. They’ve been in business since 1999. Bleeding Buckeye is billed by Elevator as a red ale, although Beer Advocate classifies it as an ESB. It’s the only beer in the contest that comes in a can, a tallboy 16 oz can to be exact. It checks in at 5.7% abv. Amber Ale by Bell’s Brewing (Kalamazoo, MI) – Bell’s beer is one of the best known and largest craft breweries in the country. They started selling beer in 1985 and were the first Michigan brewery to open an onsite pub in 1993, The Eccentric Cafe. Famous for big beers like Hopslam, Two Hearted Ale and Expedition Stout, the Amber Ale is a more conventional offering. Even though it is available year round and has been brewed since 1985 I’ve never tried this beer. In fact, I’ve passed it by hundreds of times without even noticing it, but when I was looking for an Amber Ale to go up against Bleeding Buckeye it was pretty much the only Michigan brewed option I could find in Columbus at this time of year. This 6-pack was exceptionally fresh, being bottled only 2 weeks ago. It tips the scales at 5.8% abv. In each round I give you two perspectives on the winner. We threw a party and invited a dozen of our friends (beer drinkers to be sure, but definitely not beer geeks) and had everyone choose their favorite in a blind taste test. These results are captured in a short video shot live at the beer tasting party and found at the bottom of each post. I call this the People’s Pick. I also tasted the beers side by side and offer my thoughts and pick for the best beer. I call this Pat’s Pick. Depending on your affinity for beer you can decide which opinion best represents your tastes. Better yet pick up each beer, try it for yourself, and leave a comment here to register your own vote for the winner. The deep reddish-amber color of Bleeding Buckeye is true to its billing as a red ale. I wouldn’t be surprised if they added a little red dye. You get a decent bouquet of hops in the nose. The caramel malts come to the fore in the taste but they are balanced nicely by earthy hops that impart some bitterness on the finish. It’s a good beer for a tailgate party, nicely balanced, and easy to drink. I have to admit it’s a pretty good beer, better than I was expecting. The Bell’s Amber Ale looks distinctly different, hazy and golden in color with a big creamy 2-3 fingers of head. The head retention and lacing are impressive, much better than the Bleeding Buckeye. The smell and taste remind me more of a lager than an ale. Toasty, bready malts with a hint of sweetness, not too sweet mind you, but the hops are buried pretty deep. Nice creamy mouthfeel and very easy to drink. It would be a good choice as a gateway beer for converting someone from macro lagers to craft beers. Maybe the fact that it dates back to 1985 when small breweries were pretty rare, and beers did need to use New Zealand hops or Westmalle yeast to stand out from crowd, explains the rather conservative approach Bell’s has taken with this beer. I thought both beers were good for their purpose, easy drinking beers that you could drink one after another while tailgating or watching the game, but I’m going to give my vote to Bleeding Buckeye because it is a little more adventurous. Bell’s Amber Ale gets high marks for its head retention and creamy mouthfeel, but in the end the fact that it was neither amber nor behaved like an ale, was too much for me to pick it as winner of the Amber Ale category. 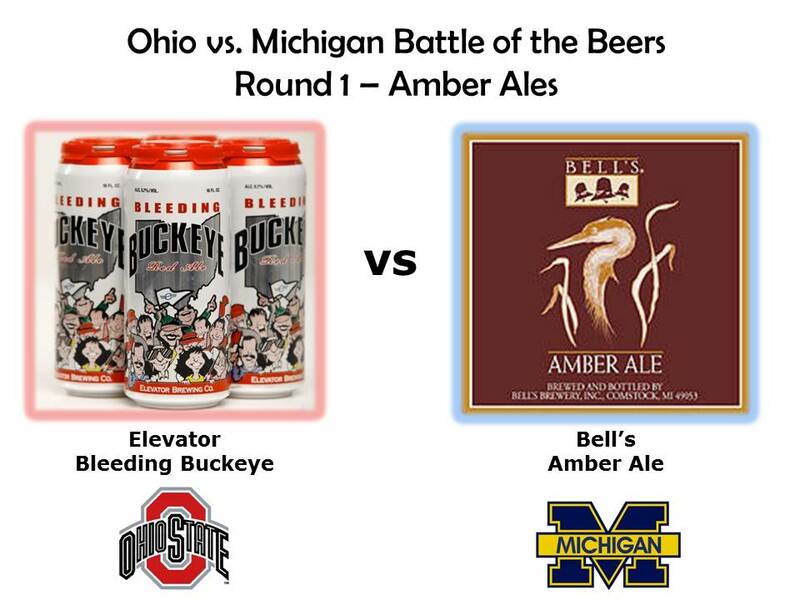 On a 1-10 scale I’d give Bleeding Buckeye a 7 and Bell’s Amber Ale a 6. See the video below for the people’s pick. This was a good beer to start the contest, as most everyone found both beers to be decent but not exceptional. It became readily apparent as the night wore on that several participants were pretty averse to hoppy and bitter beers, and that shows up in the way these two beers were judged. My first guest, Maren, captures that pretty well in the way she describes the beers.